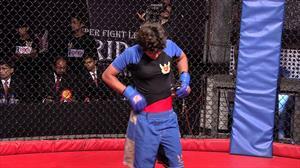 Age : 21 yrs Height : 159 cms Weight : 54 kgs City :Mumbai Manjit is a two time Gold Medal winner in Kick Boxing at the National Level. She has also won the 'Jhansi Ki Rani'- bravery award for being a Gold Medalist State Level Boxer. She is a quiet girl outside the ring and is determined to win the SLF.